Fort Island Trail Park is worth a quick stop on your drive west down Fort Island Trail (CR 44) to bird and use the facilities. Check for shorebirds (including Lesser Yellowlegs, Willet and Least Sandpiper) and wading birds (Little Blue Heron, Wood Stork and White Ibis) from the fishing pier, as well as wintering ducks and Common Loons on the river. Brown Pelican, Double-crested Cormorant, Anhinga, Laughing Gull and Boat-tailed Grackle are fairly common here. Bald Eagle, Osprey and Belted Kingfisher turn up with some regularity as well. Vegetated edges and trees in the park’s interior can attract songbirds such as Gray Catbird, American Redstart and Blue-headed Vireo, but waterbirds are this site’s stronger suit. Listen for Clapper Rail and Marsh Wren in the marsh across the river. 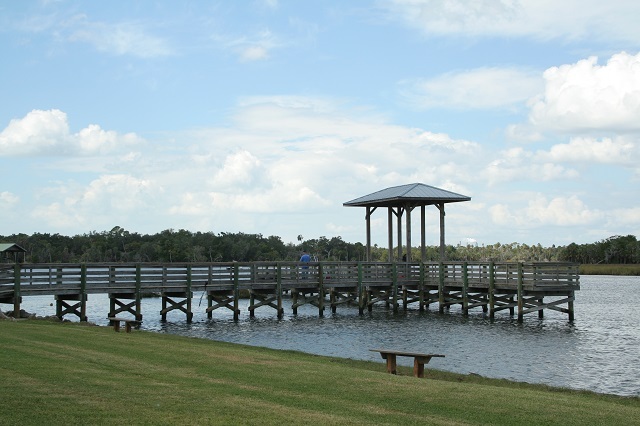 This site is a launch point for the Nature Coast Canoe and Kayak Trail, so bring your own boat if you want to paddle the scenic waters of the Crystal River.